Measuring 10′ x 10′ there is oodles of room for you to entertain in style. The frame is made from powder coated steel making it durable as well as attractive. So you have the peace of mind to know that the frame is rust and weather resistant. How absolutely divine for your entertainment area is the Home Madaga Gazebo . The cover is made from 100% Terylene. 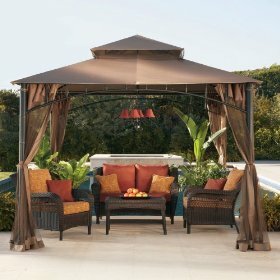 And the beauty of this gazebo is that when the sun starts to go down and the mosquito’s begin to make their appearance, there is no need for you and the family to move indoors. Simply lower the mosquito netting and continue on partying. There is some assembly required to erect this gazebo. And here is a view of the Madaga gazebo with its easy to add mosquito net attached. 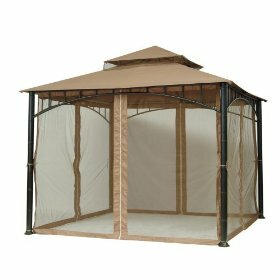 The net is is both weather and UV resistant, and keeping those pesky bugs away is sure to make your time outdoors even more enjoyable.